I got up early to make my way up North to see the home of the Senators. It is about a 4-hour drive to DC from Roanoke, which in the whole scheme of things was a short drive for me on this long journey. 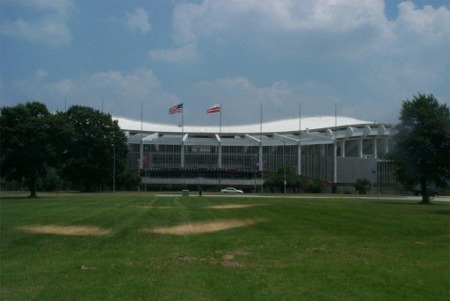 The second coming of the Senators played their home games at Robert F Kennedy Memorial Stadium (RFK) in Washington, DC from 1962 to 1971, prior to moving to Texas and becoming the Texas Rangers. I always thought the history of the Senators was so interesting and strange. The original Senators were famous for the vaudeville joke “First in War, First in Peace, last in the American League!” Although, that was from when they played their games at Griffith Stadium (demolished in 1965). The strange twist was that they left Washington after the 1960 season to move to Minnesota becoming the Twins in 1961. However, they were immediately replaced by the expansion Washington Senators the following season. So the Minnesota Twins and the Texas Rangers were both originally the Washington Senators. The new Senators played their first season at Griffith Stadium in 1961. They did not move into RFK Stadium, which was originally called the District of Columbia Stadium, until 1962 (the stadium name was not changed until 1969). The stadium had opened in the prior year for the NFL’s Washington Redskins, who played at RFK through the 1996 season. 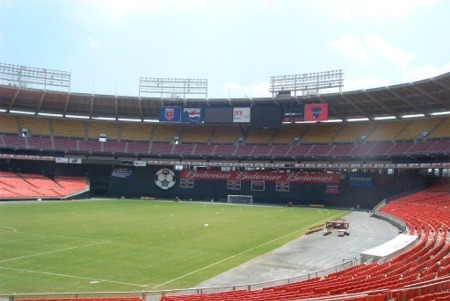 Since the Senators left after the 1971 season and the Skins after 1996, the stadium has been predominantly the home of the DC United of MLS soccer league. 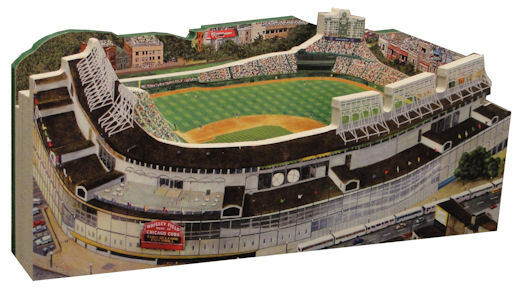 This all means that I will not be able to see a baseball game here, but it does not mean I will not get to see the stadium. I was able to contact Troy Scott of DC Sports and Entertainment to show me around RFK. I started off with my traditional walk around the outside and noticed that the roof somewhat reminded me of Hiram Bithorn Stadium with the wavy look that almost looks concave. The other things that stood out were the two statues outside. One statue was for Clark Calvin Griffith, who was a player, manager, and eventual owner of the Senators. The other statue was of George Preston Hall, the founder of the Redskins. I like the way they celebrate and honor the history of the teams that played there. Once inside, you see more of the respect for history with the banners of player’s names along the upper deck rim. Included are baseball players like Frank Howard, football players like Sonny Jurgensen, and owners like Clark Griffith. Some of the other historic perks had to do with the few white seats, recognizing monumental home runs hit by Frank Howard. What stands out about them is how they are situated in between all the bright orange, yellow, and red seats, which are not unlike the Astrodome. The fun part for me was the personalized tour provided by Troy. We walked all over the stadium from the concourses to the field to the seats and through the locker rooms and to other places you would not ordinarily have access. When we were in the basement corridors, Troy found some of the old Cracker Jack Baseball programs and baseballs to give me. He talked about how they played that old-timer game at RFK in 1983, which was famous for the 75-year-old Luke Appling hitting a home run (I remember watching that on TV too!). He also spoke of how there were not too many other baseball games played at RFK after that game. In fact, the last game played at RFK was a spring training game between the Expos and Cardinals in 1999. He talked about how the stadium was designed with a complex conversion system to move some portions of the seats to accommodate football and then back to baseball. I also read that the bleacher section is less stable than other seating, which allowed fans to jump and cause the whole section to shake and rumble. The most interesting thing that he discussed was that he did not think that system would work anymore to convert back to baseball. As we walked on the field, it was set up for soccer, since that is the main sport played here. The amusing thing at this point a few years after that day is that they did figure out a way to make it baseball-friendly again when the Expos moved to RFK in 2005, while becoming the Washington Nationals. It is also amusing that the prior spring training game included the Expos as well. We also talked about what the field was like for baseball and football. The first thing he said, was that Redskins fans like this stadium better than there new one. However, based on my conversations with him, and from what I have read, it does not appear that the stadium was well suited for watching either baseball or football because they tried to make it work ok for both instead of really good for one sport. Some seats were too low for football and others were too high and far for baseball. Light towers were not allowed on the roof of the stadium because RFK was close to the Washington Monument and the Capital Building, so they had to install arc lights, which were not as favorable for fans or players. 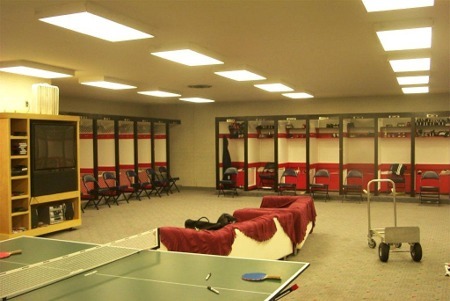 He took me through the current locker rooms as well, which were nice, but plain and simple compared to some of the newer stadium locker rooms I have seen. They did have a Ping-Pong table, which is of course vital though. The most interesting thing I saw going through the back areas and offices was a Senators’ usher uniform incased in plastic up on a wall. I thought it was very cool that they displayed that. Bottom line – Overall, it was a blast to find my way into another old stadium. So far, my experiences with Candlestick Park, the Astrodome, and RFK, have been more fun and memorable than the currently used stadiums. The fact that I had great people take me behind the scenes and even leave me with swag made those experiences special.